The Thomas Kelly Youth Foundation was formed following the death of 18-year-old Thomas Kelly, who was king hit in an unprovoked attack in Sydney’s Kings Cross in July 2012. The Foundation’s voice has been a powerful catalyst in communicating the need to keep our youth safe though education and Take Kare initiatives. 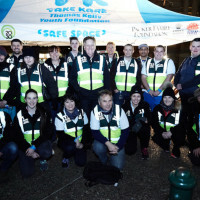 The Foundation has implemented the Take Kare Safe Space and Ambassador program in Kings Cross, Town Hall and Darling Harbour. Stay Kind takes its name from Stuart’s initials, just as Take Kare takes the initials of his elder brother – Thomas. Stay Kind encourages not only youth, but the entire Australian population to care for one another. It encourages families, friends, colleagues to be a kind and compassionate community, it is important to show empathy whilst also acknowledging and recognising that many people suffer in silence. Young people may find themselves overwhelmed by life or by others, and be unable to speak out. They may not seek help for themselves when this happens or if they are dealing with mental health issues. Australia has one of the highest rates of suicide in the world, with youth suicide being the leading cause of death for youth in Australia. In 2015, 3027 people ended their own lives in Australia. That’s 8 people every day, or 1 person every 3 hours. It is estimated that of these 3027 half may not have a mental illness or may not have accessed mental health services. The responsibility for this loss of lives does not just rest with the individuals who decide to end their lives. As a society, we are currently experiencing significant changes in social values, behaviours and respect shown to others. Social media is one of many platforms that demonstrates this. These changes do not only impact on ourselves - they impact on others too. Our culture of taking things on the chin can discourage youth from speaking out when respect from others is at its lowest. It is more important than ever to create an environment of kindness, care and empathy. The Foundation is raising awareness across the community through its Stay Kind initiatives. As part of this awareness campaign the Foundation has partnered with the NRL, Wests Tigers and Parramatta Eels for a Stay Kind Day, to be held at ANZ Stadium on Monday April 2, 2018.